EcoSlider EL greenhouse is designed specially for Northern countries with cold and snowy winters. Unique reinforced arched shaped frames are engeneered to increase the overall strength of the greenhouse by spreading the snow load over the surface. Applying the steel with zinc coating helps to protect the frame from corrosion for more than 10 years. Due to use of high quality polycarbonate cover this greenhouse will endure even the harshest weather: strong winds, wet snow, hail and UV radiation exposure. Arch shaped construction is similar to a transparent tunnel, which is closed off at both ends by large doors and ventilation windows. Such shape provides full and even inner space lighting and streamlined design reduces stratification of light. All components are compactly packed into carboard boxes. Metal and polycarbonate parts of EcoSlider EL greenhouses for safety reasons are shipped in separate boxes. • Basic kit is packed into 4 boxes. Greenhouse is made of standard 1.05m long modules (Kits) making greenhouse assembly easier and allowing to expand the greenhouse to the required length. The length of the greenhouse could be increased by adding the desired number of Extention Kits. Thus the length of EcoSlider EL greenhouse has no limits. For example: 8.4 meters long greenhouse consists of one Basic Kit and 6 Extention Kits. Warranty period of all greenhouses produced by Heikkinen OÜ is up to 10 years. • Warranty on polycarbonate from the loss of mechanical, optical and thermal properties is given by the manufacturer for up to 10 years provided that the mounting and operation technology is applied. • Warranty period of zinc cover of trusses is 10 years. 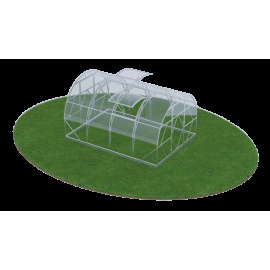 • General warranty period of movable elements of the greenhouse is 2 years. • Warranty period of other elements of the greenhouse is 2 years. Most products are shipped from stock within three business days and are delivered, as a rule, within one week to European Union countries (EU), or within two-three weeks to non-EU countries. This greenhouse is great for growing all types of plants: you can breed seedlings, cultivate warmth-loving plants, harvest early and off-season crop of vegetables, grow flowers and even grapes. Foundation of the arch shaped frame is made of parallel bows with internal weaving and reinforcements, which make EcoSlider EL greenhouse extra durable. Our company offers EcoSlider EL greenhouses in standard width size of 3 meters. EcoSlider EL greenhouses are equipped with a 6 mm polycarbonate cover and metallic foundation with 100 cm distance between beams. If necessary, EcoSlider EL greenhouse can be easily moved from one place to another, without disassembling it, by removing ground fixtures at the first location and by fixing them in second location. Automatic ventilation and watering options as well as Modules for water & electricity supply are also availiable.